He is the CUTEST little cowboy I have ever seen. You can do this too if you have medium sewing skills. I know it looks complicated, but it isn't. Hemming is the bane of my sewing existence. This project took me less then a hour and a half. Before we get started, let me introduce you to Beverly, my new girl. 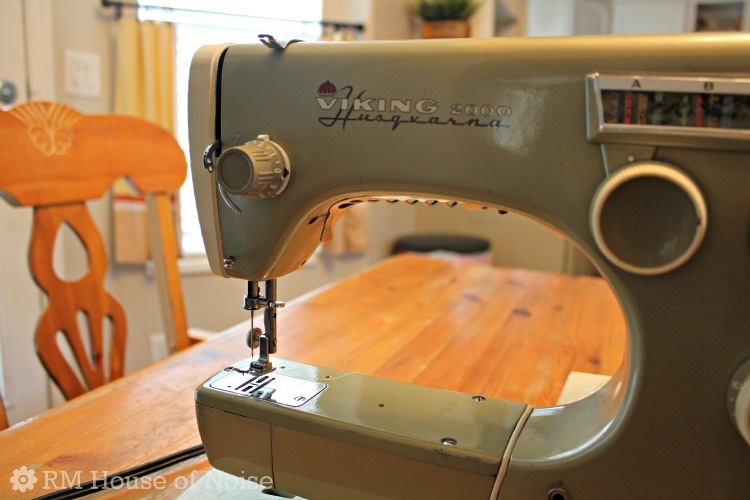 Beverly is a 1964 Viking Husqvarna sewing machine. This is one of those old "work horse"machines. And she lives up to her reputation. The stitches are perfect and even. And she is so quiet whilst sewing, like a kitten purring. My old machine broke.... again. I don't think a $120 singer was ever ment for my level of sewing madness. So I found Beverly in the classifieds for $30. I went to meet her and I fell in love. She's an older gal and she needed a tune-up and oil but after that she is happy to once again, be applying her craft. Is it strange that I name everything? Never-mind... I really don't need ya'll weighing in on my various levels of madness. This is a sewing post and sewing posts are hard because they require a huge amount of pictures (30 in this one) and they also require lots of instruction. So be patient and try to ignore all of my type-o's because they will be plentiful. * 1 yard of fabric, I got a faux suede type of fabric that does not fray (the fabric was $6.95 a yard at Wal-mart) It is important that the fabric will not fray for this project. 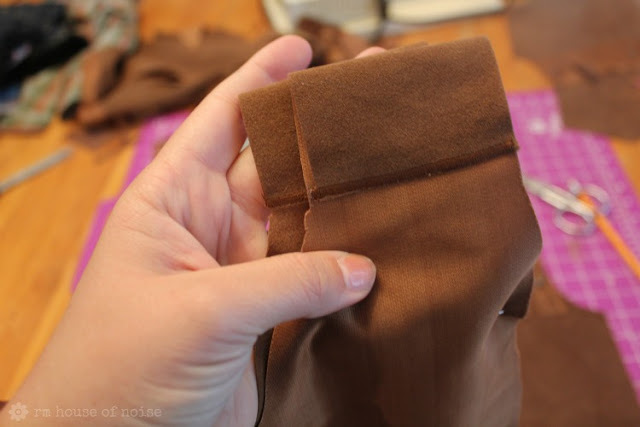 If your fabric frays add extra for hemming. Also, these chaps were made for a 50lb 6 year old boy. If your child is larger then this you will need more fabric because this was just the right amount for the chaps and vest. Likewise if your child is smaller you could use less fabric. 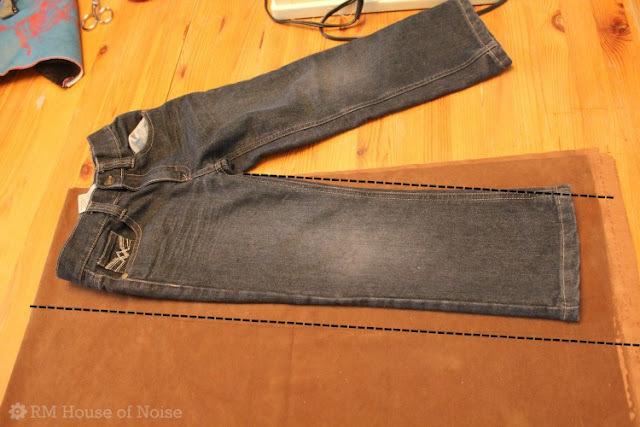 A good way to measure would be to measure the length of a pair of jeans from top to bottom and add about 4 inches to that measurement. 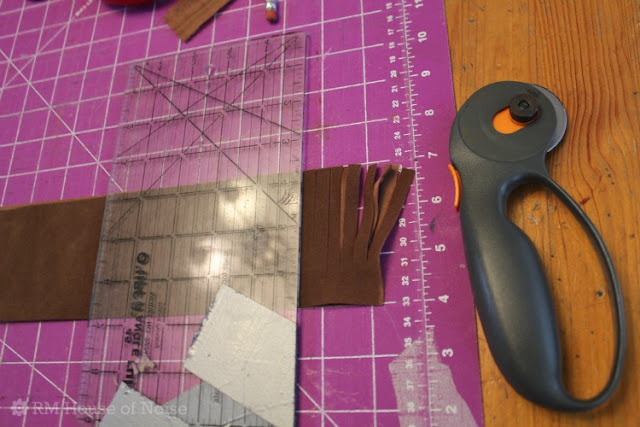 * A rotary cutting tool, mat and ruler help a lot, but you could improvise and just use your scissors. This is how I laid it out. Please lay it out however your pieces fit best. This is only to give you an idea on how to get it all to fit. You're layout needs will probably be different then mine were. I drew black lines on these pictures so you can see more easily where you need to mark and cut. 1. Fold the fabric into fourths. You will need to cut out 4 of these legs. 2. 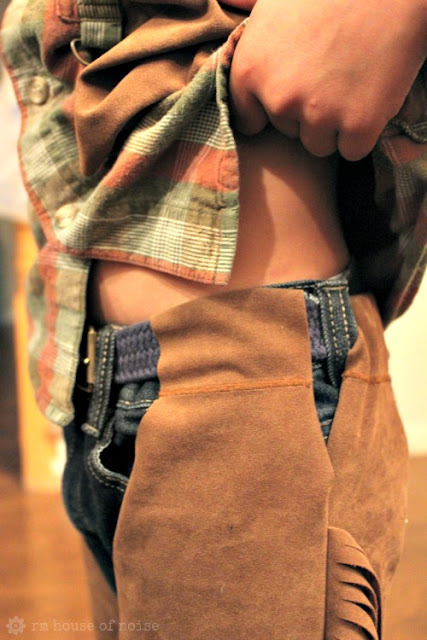 Lay out a pair of jeans (that fit your kid) on top of the folded fabric and mark about an inch away from them down the side. 3. Mark a line about 1/2 inch away along the inseam. 4. 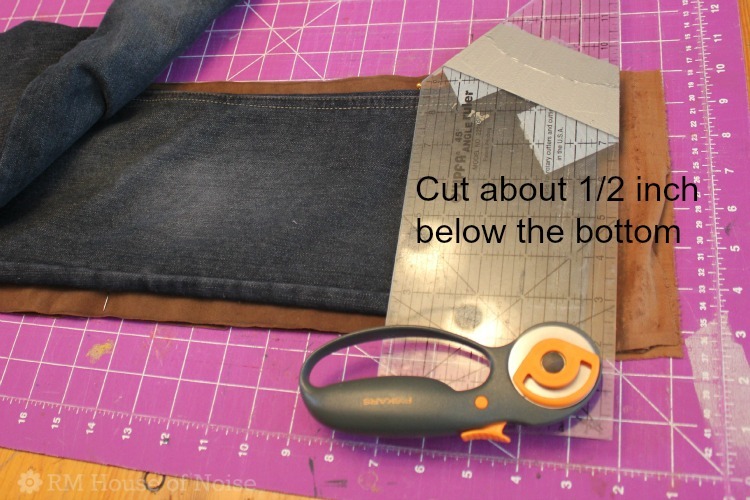 You need about 2 inches of fabric at the top of the jeans and about 1/2 inch at the bottom. 5. 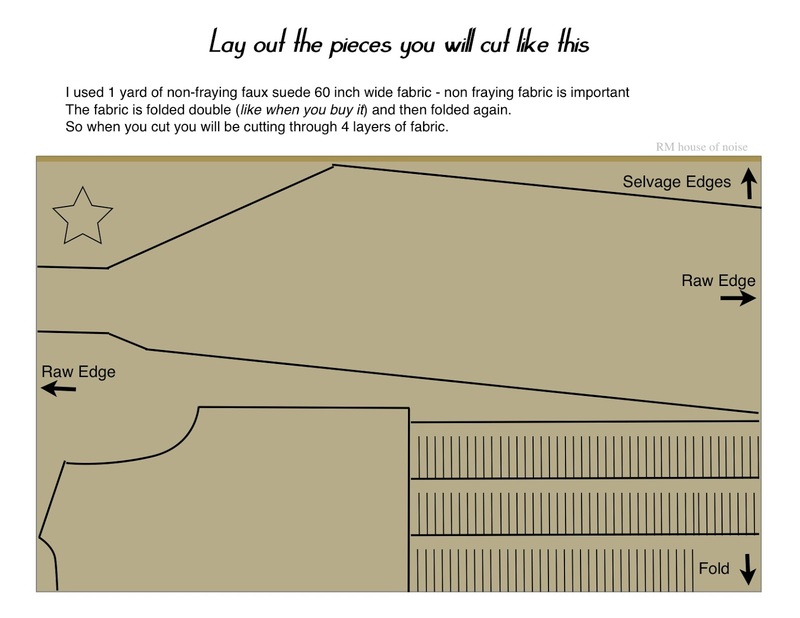 Cut the fabric about 1/2 inch away from the bottom. 6. I used a plate to round off both of the corners at the bottom of the legs. 7. 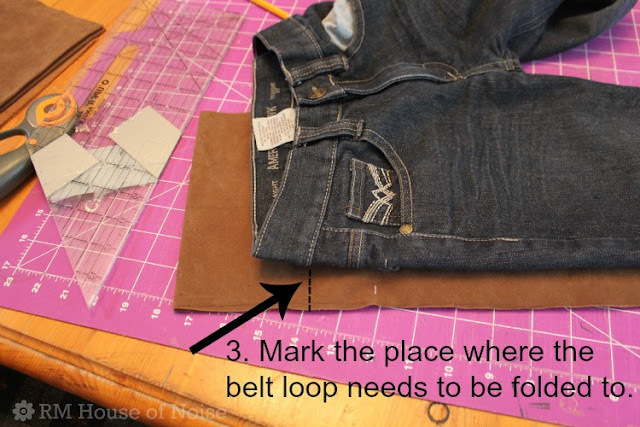 Mark the waist of the jeans right below where the belt loops should be positioned. I hope ya'll can see the lines drawn on this picture good enough. I tried to draw them dark enough. 8. 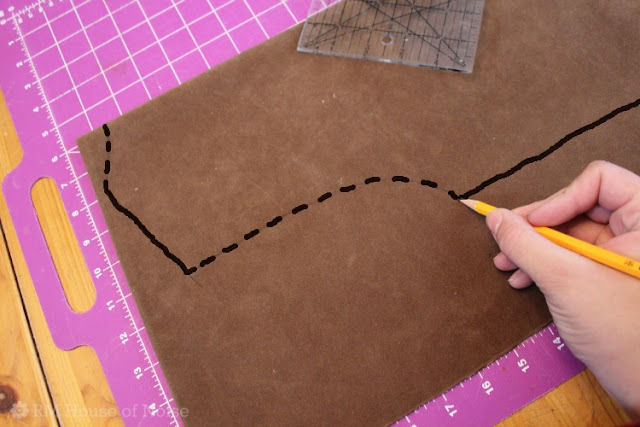 The "tab" I have drawn on the left there is what will fold over to form the belt loop. 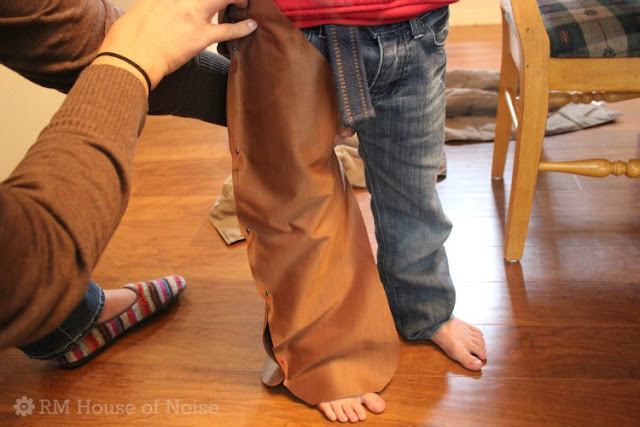 You will sew it down to make a loop and when your kiddo wears his costume you will loop their belt through this in order to hold up the chaps. 9. The line drawn diagonally from the inseam over to the tab is where the chaps are cut out in the front and also in the back showing the jeans through. 10. The little cut out on the bottom left is space left where the belt loop on the jeans will fit through. This is an important tab. You need this tab, do not cut this tab off. You can see here how the tabs are folded over and there is a space cut out so the side belt loop can fit through. Hopefully this picture explanes it better then my inadequate words can. 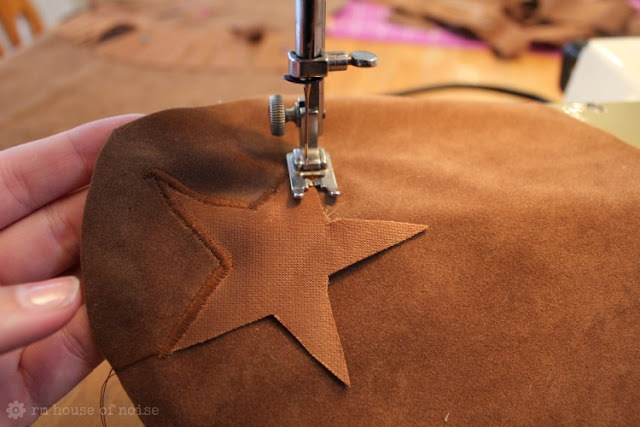 Using scrap fabric I cut out some stars to use for embellishment. I traced the stars with a cookie cutter. About this time I pinned a side together and tried it on my little man in order to make sure it was not too small. Better for it to be too big then too small, it looked like it would be just right. 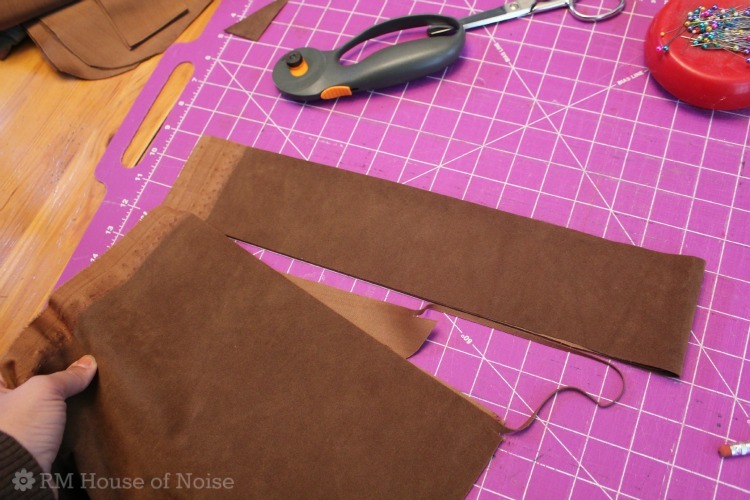 With some scrap fabric I cut a few 3 inch wide strips to be used as fringe down the sides of the pants. With my ruler and my rotary cutter I cut the fringe. I didn't measure I just estimated. 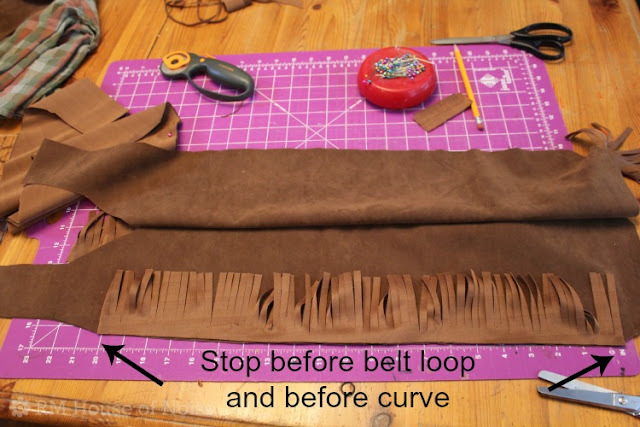 Put the fabric right sides together and pin the fringe along the inside. IT IS VERY IMPORTANT TO MAKE SURE YOU HAVE TWO OPPOSITE FACING SIDES! I almost didn't take a picture of this for you but I glad I did because I saved myself from doing it wrong. Make sure you have opposite sides. Also, see the tabs at the top left? Pin them down. Then sew them down, like this. I just used a tight zig-zag stitch to sew them down. None of that fancy folding and hemming here thank-you-very-much. These will be what the belt goes through to hold the chaps up. 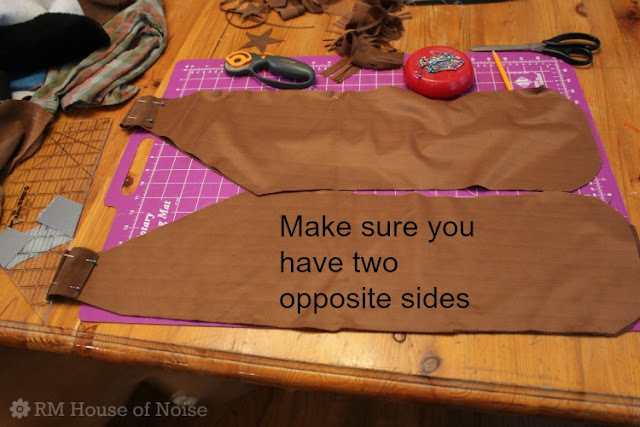 Place the two half's of the leg together with right sides facing. Pin the fringe inside. Sew it down. When you turn them right side out it should look like this. I just pinned it on and sewed it down with a zig-zag stitch that was close together. You can iron it on with some wonder-under, but sewing it down to secure it is best. Then turn the legs right sides facing once more and sew together the inseam of each leg. Turn them right side out and they should look something like this. 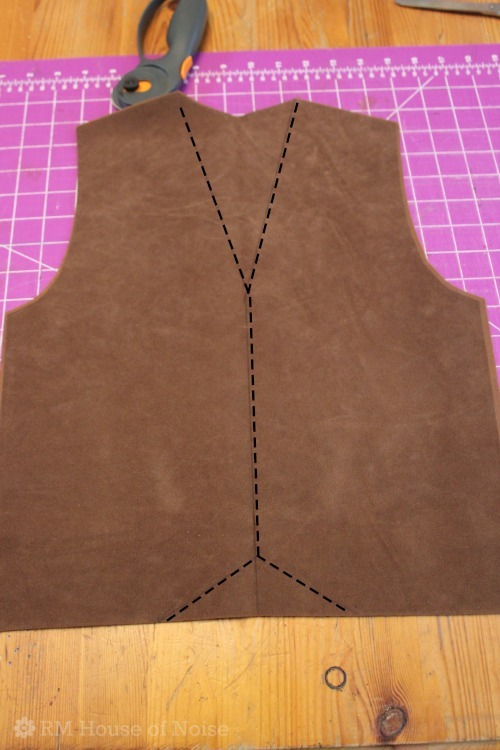 Layout a shirt on top of the fabric and trace along the shoulder and side seam. I didn't add much extra seam allowance when I traced because the shirt was already pretty baggy and I wanted the vest to be fitted. If you are tracing a shirt that is tight on your child add some room for seam allowance. I just guessed where to draw the lines for the neck and the sleeves. Take one of your vest pieces and cut out the v-neck and down the middle of the vest for the vest front. I added a little cut out at the bottom too just for fun. Measure where you want the fringe on the back of the vest. I measured 6 inches down from the middle and 4 inches down from each of the arm holes. But you could put it straight across, or wherever you like. I also pinned some fringe to the front. 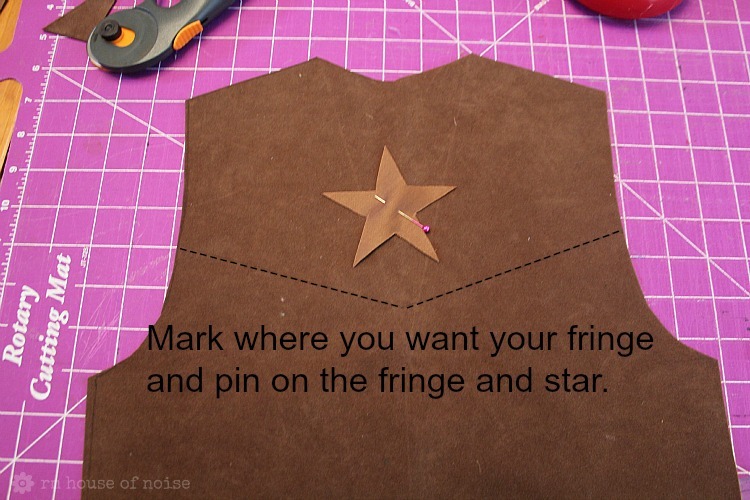 After you pin the fringe and the star on sew them down, just like I did with the star on the chaps. I sewed them right on top with a tight zig-zag stitch. Pin the vest together and sew the shoulders and the sides. I told you it wasn't very difficult. Have your little cow-kid try it on and cross your fingers that it fits. And then email me a picture! I want to see how you made this idea into your own. Thanks for the tutorial! I'm going to try this for my son. He's going to have a cowboy theme for his 1st birthday! Wish me luck! I'm attempting this for my kids Halloween themed birthday party! They decided they wanted a costume party and want to be Cowboys!! I love this post! 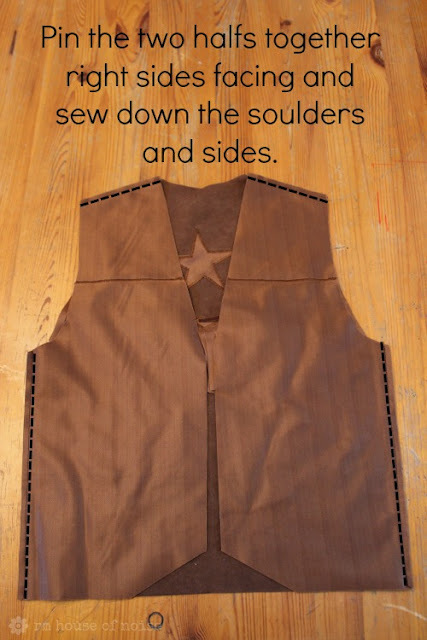 I'm working on a little vest for my just-2-year old for his b-day this weekend which is a little more complicated (because the tutorial I found first has a lining) but mostly the same idea - except I love your idea of adding the stars!!! I'm so going to steal it ;). 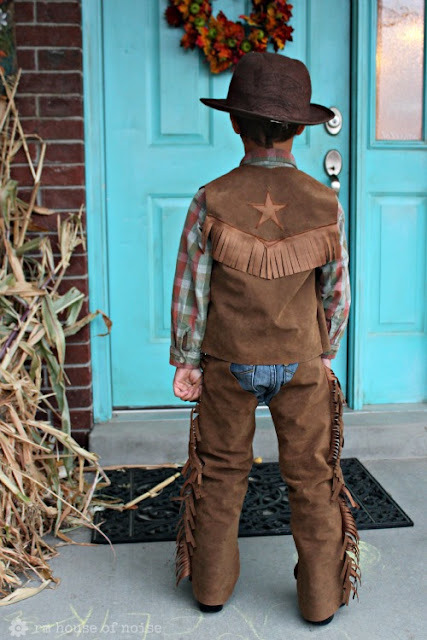 Also - I made some chaps a few years ago for my daughter for cowboy day at pre-school - but not nearly this good (just felt cut to cover the front of her pants with a little felt strap around the knee - fringe cut on the outside and safety-pinned to her belt) - but I'm pretty sure both kids are going to need a full outfit after reading this! Thanks for sharing! 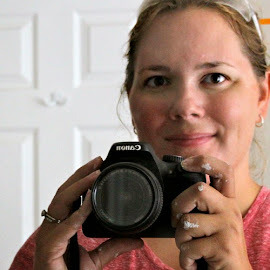 Merci beaucoup pour ce super DIY, facile et rapide ! je l'ai fait hier pour le "bal de promo" de mon fils de 22 ans, en tissu plastifié marron (je n'ai pas trouvé de tissu imprimé vache), le résultat est formidable !!! Si vous voulez, je peux vous envoyer des photos. 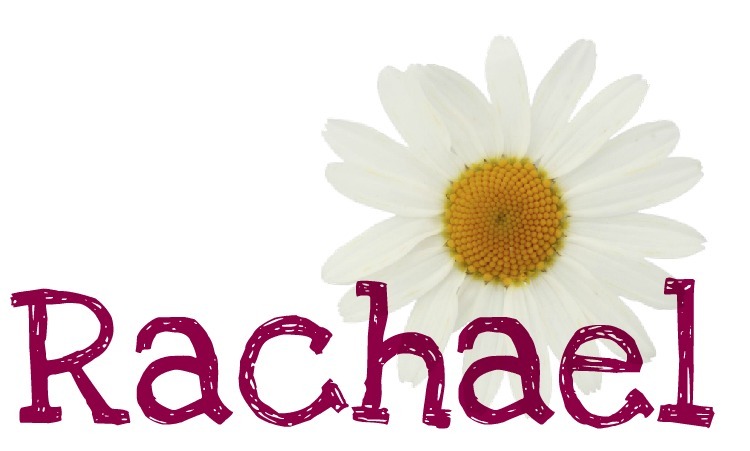 traduction => Thank you very much for this great DIY, easy and fast ! I did yesterday for the "prom" my 22 year old son, brown laminated fabric (I did not find cow print fabric), the result is great ! If you want, I can send you pictures. Great tutorial! 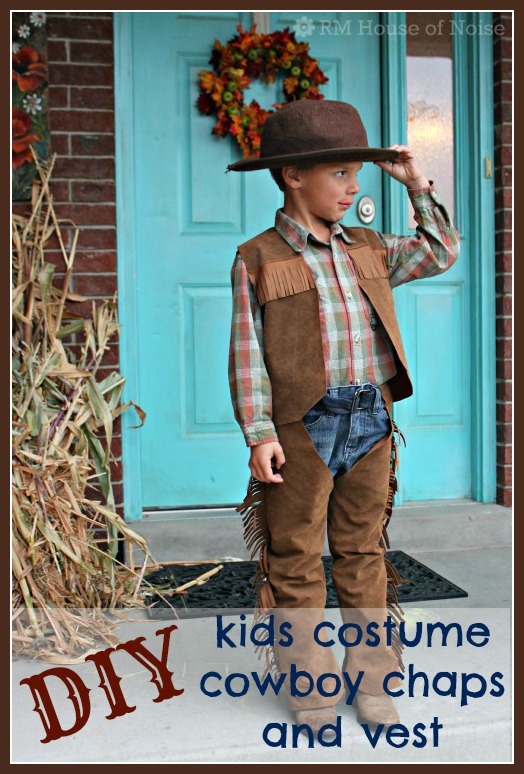 I am gonna make this for my little guy for Halloween this year! Awesome tutorial!! I am going to make this for my 8 year old son for his next pageant!! Thanks! !It is easy to follow and makes perfect sense. Thank you for taking all of the thinking work out for me! I am headed to Walmart to buy some fabric! Thank you for a wonderfully easy tutorial. I just finished this outfit for my 11 year old son. 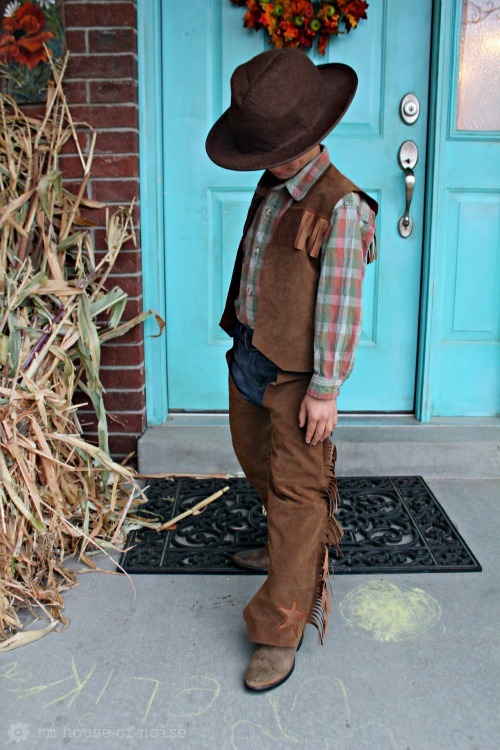 He plans to dress up as a western cowboy for Halloween next week. I have a quick question. In the first picture it looks like the pant leg is parallel to the salvage but then in the next pic with the jeans it looks like the salvage is parallel with the bottom of the jeans. I am trying to figure out how to lay out my pieces before I cut. Thank you so much!! It was when I took the photo, but I changed it because it fit better the other way. 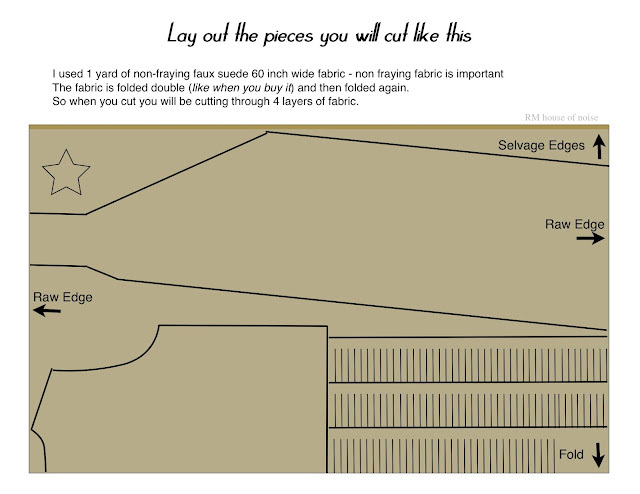 Do this the way it fits best in your fabric. It won't make too much of a difference. Love this! I'm making it for my 15 month old's Halloween costume but I'm using felt instead of regular fabric. 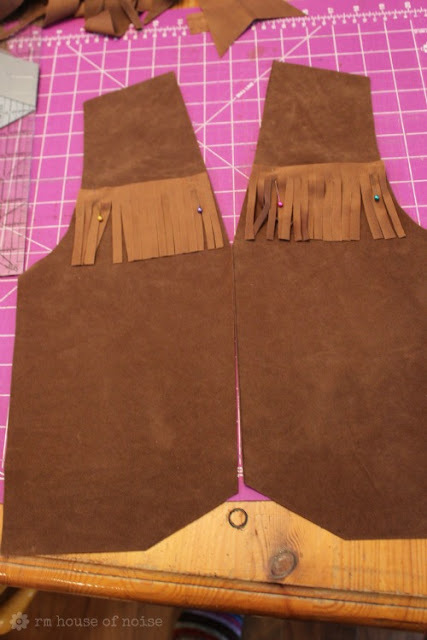 Already made the vest and I'm working on the chaps. I also made a belt with belt buckle and I'm working on a felt cowboy hat. Hi! I wanted to say thank you for putting up this tutorial. I made my toddler a costume and he looked AMAZING. It was really pretty easy to do and took me maybe 2 naptimes to finish. People were really surprised when I told them I made it myself! I have some photos up on my blog which hopefully will link to my comment. I'm 12 years old, and getting ready to go to a costume party. I really wanted a pair of chaps and a vest. I accidentally found your website, and I tried making a pair. I think that it turned out good. I really like them, thanks for your posting! You've made my Halloween costumes so easy this year! My oldest is the Sheriff, her younger sisters are cowgirls and my infant son is the deputy! 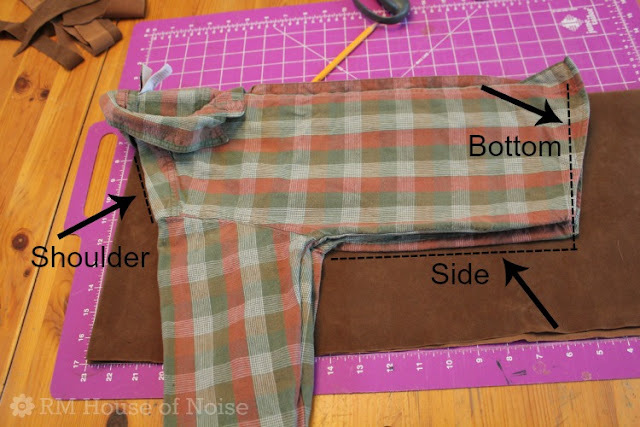 I have a lot of sewing to do :) Thanks for putting this tutorial together! We made these last night and they came out amazing! I haven't used my sewing machine in about 5 years but I was able to follow your tutorial without any issues!!! Thank you so much...my daughter is so excited about her costume! Thanks! 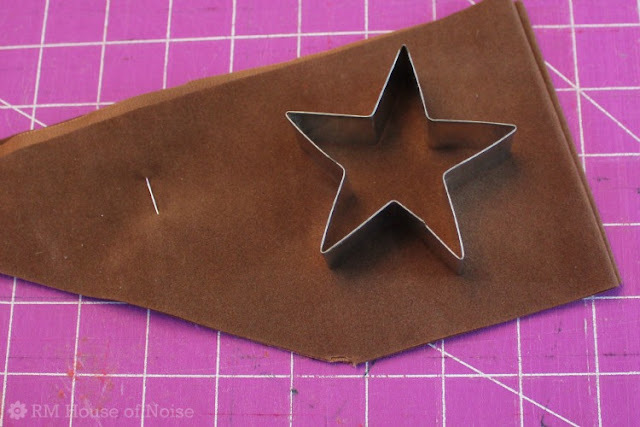 I just finished making this for my 8 year old cowgirl. I love that it's so adaptable! Very easy instructions and I appreciate that you shared it. Thank you for these great, precise and easy to follow directions. I made both the chaps and vest for my 4 year old Granddaughter. Chaps aren't just for boys ya know! Thanks so much for this tutorial! 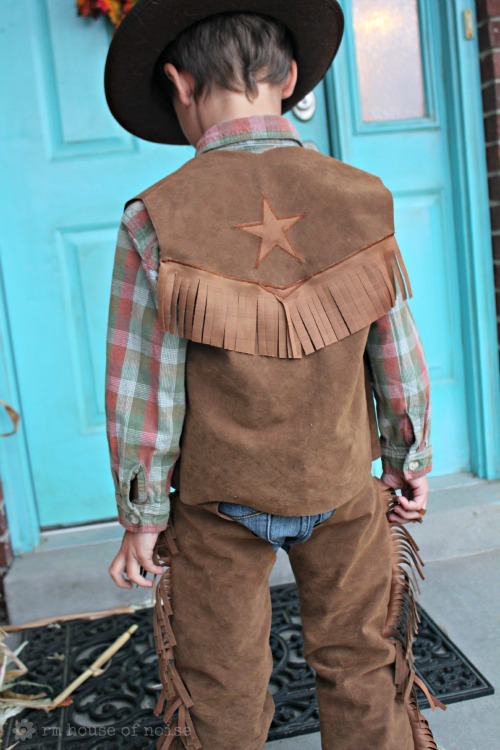 I purchased a really cute cowboy costume for my son a while back but it was missing chaps to be complete. Your tutorial helped me complete the ensemble. I purchased a rotary set based on your tutorial and I'm so glad I did. It made the whole project easier. I did make one change. 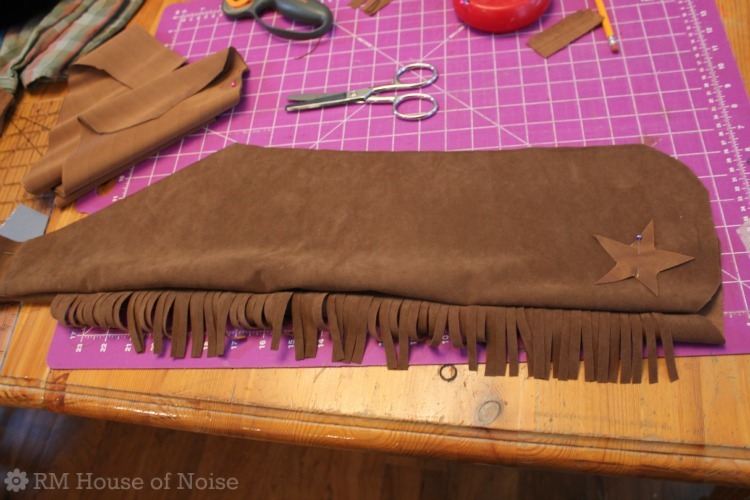 I doubled the width of the fringe, folded it half, and cut the fringe from the "cut" edge towards the fold. 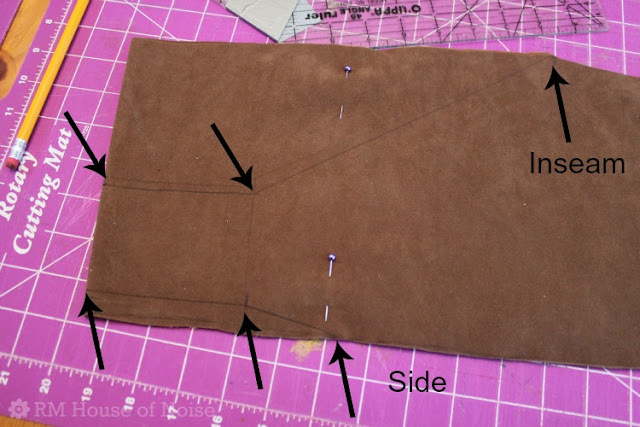 The I sewed the folded edge in between the outside seam sides. This allowed for double the amount of fringe and it looks great. Thank you so much! This is what my grandson wants for his birthday. Funny part? He's turning six and that sewing machine is my sewing machine! I love my Husquavarna! I got it from my sister when she died and she got it from her mother-in-law. It's a keeper! I have a house full of boys too! Of my eight children, six are boys. Of my nine grandchildren, six are boys. When our whole family gets together, that's 22 people and a lot of noise as the cousins play happily together. They are all 8 years and down to 2 years. So much fun! Great pattern, thank you!. I made this for my grandson because I wanted something quick and easy. Thank you for the great pictures and easy to follow directions. This turned out great! Again, thank you for sharing! Thank you a 110 times over! Your tutorial was so easy to follow. The whole project only took me twoish hours and the outfit turned out amazing! My little girl was so happy! 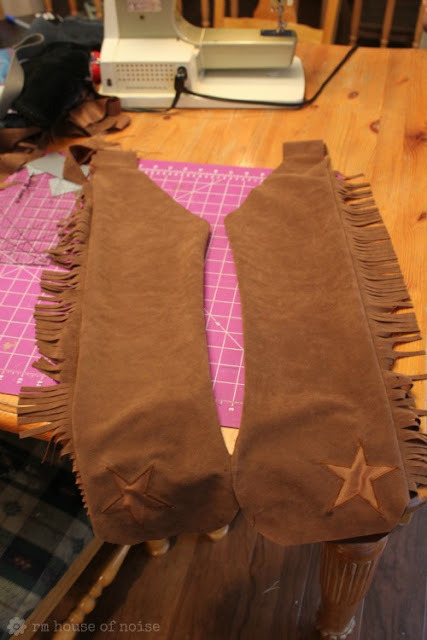 I even had enough fabric to put double fringe down the legs, yet your pattern pieces were placed so well I hardly had any wasted material. And Walmart still has the fabric for the same price. :-) Thank you again and again! I've been busy decorating for my favorite time of year. 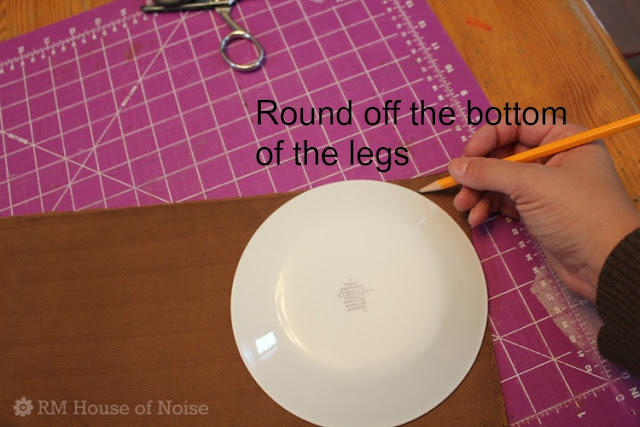 All content and pictures are copyrighted by RM House of Noise. If you would like to feature one or more of my ideas or projects please do. Features are strongly encouraged and welcomed, but please use only one or two pictures and link back to RM House of Noise. I'd also love an email or comment letting me know so I can check it out. Thank you so much for visiting! Hope you enjoy! RM House of Noise. Simple theme. Theme images by enjoynz. Powered by Blogger.